KALANDIYA, West Bank (JTA) -- The U.S. congresswomen get off the bus and stand in the chilly shadows of the Kalandiya crossing point between the West Bank and Jerusalem. It’s late morning, well past the rush hour when thousands of Palestinians congregate here, and only a few dozen Palestinians stand in line. To cross, the Palestinians go through a series of metal turnstiles and wait with their documents until they are called, one by one, to approach the Israeli soldiers sitting behind bullet-proof barriers. One Palestinian man strikes up a conversation. After crossing to the Palestinian side, the congresswomen -- part of a trip to Israel and the West Bank organized by the J Street Education Fund -- head to Ramallah. The congresswomen clearly are moved by their experience at the checkpoint, and that’s the point. J Street, the “pro-Israel, pro-peace” lobbying group that heralds itself as a left-wing alternative to the American Israel Public Affairs Committee, is trying to present an alternative to the usual pro-Israel fare on congressional missions to Israel. The trip last week included six U.S. congresswomen and a group of women from the Women Donors Network, a coalition of women involved in progressive and social causes. A spokeswoman for J Street, Jessica Rosenblum, said the trip was part of the organization’s overall effort to promote a two-state solution. Among the Palestinian business leaders the group met in Ramallah was Sam Bahour, a Palestinian-American entrepreneur who says he has had difficulty acquiring an Israeli residency permit. On the way to the Kalandiya checkpoint, two women from Machsom Watch, an Israeli organization that monitors Israeli soldiers at checkpoints, spoke to the group. If the delegation members’ reactions were any gauge, J Street’s strategy shows promise. The congresswomen also heard from Palestinian businesswomen and female hedge fund managers who described ways to empower Palestinian women in business. A single mother living on welfare, Moore began her public career as a community organizer and today is also the Democratic chairwoman of the Congressional Women’s Caucus. The J Street trip also included visits with Jewish settlers in the West Bank. From Ramallah, the group drove to Shiloh, a Jewish town in the heart of the West Bank halfway between Ramallah and Nablus that because of its location likely would not be incorporated into Israel in any two-state settlement. A group of Jewish women from several area settlements met with the congresswomen and told them they have no intention of leaving their homes. Several members of the delegation said the trip gave them a more sophisticated understanding of the complexities of the Israeli-Palestinian conflict. You may recall my article about my friend Walid Abu Rass who was arrested by Israel and placed under 6-month administrative detention. You may also remember reading his daughter's passage about her visit to the prison. By the way, Israeli peace activist/historian Uri Avnery wrote today about this infamous process of administrative detention. Many of you acted to free Walid and I'm pleased to report that we achieved partial progress. Under military occupation all progress is partial! After losing his appeal, which was a joke given the judge is a military judge from the occupation forces, he took his case to the only other court that Israel, the occupying power, respects (and even that, not always), the Israeli High Court. I just heard from Walid's wife and the organization legally representing him, Addameer . Walid's wife attended the High Court hearing. It too was a joke. At the appeal last month the state claimed that Walid was a PFLP operative. The PFLP is a left-wing, political part of the PLO, the same PLO that Israel signed the Oslo Accords with. Now, at the High Court hearing the state presented to the 3 judges a letter saying he was an Islamic Jihad operative. The Islamic Jihad is a Palestinian Islamic party not part of the PLO. Even the judges were embarrassed and questioned the state prosecutor about how the same person can be viewed so differently. After the some back-and-forth between the state and the judges, the state withdraw the latter submission. Walid was not even present in the courtroom! When Walid's attorney inquired about the absence of his client, the judges told the attorney if he wanted him to be in the courtroom they would need to postpone the hearing. An old game to buy time until the administration detention order expires. Walid's attorney and wife agreed to continue without Walid's presence. After hearing the case, Walid's wife and attorney were asked to step out of the courtroom. Thirty minutes later, after the judges deliberated, they returned and were told that the court decided to reduce Walid's detention time by two months, which gives him a new release date of March 22. The judges added that this would be the release date unless concrete evidence is presented by the state. It's all so sick. He should have been released today! How can a court of "law" keep a person imprisoned AFTER deliberating that the state's case was flawed to the point of accepting to release the detainee! I just wanted to let everyone know where things stand. Walid is in high spirits. Walid's two girls are looking forward to see their dad soon. Walid's wife is correctly worried that the administration order may get renewed, which happens frequently. In fact, it closed long ago. In terms of settlers and Palestinians, the Israeli government treats the whole country as one. Last year it demolished three times more homes ofIsraeli citizens (Arabs, of course) than it did in the Occupied Palestinian Territory. The demolition of Bedouin homes in the Negev/Nakab is part of a plan approved by the government to remove 30,000 citizens from their homes and confine them to townships. A for the international community, the “Quartet” representing the US, the EU, Russia and the UN in the non-existent “peace process” has gone completely silent. (Israel refused to table its position on borders and other key negotiating issues by the January 26th “deadline” laid down by the Quartet, and no new meetings are scheduled). The US has abandoned any pretense of an “honest broker.” Months ago, when the US entered its interminable election “season,” Israel received a green light from both the Democrats and Republicans to do whatever it sees fit in the Occupied Territory. Last May the Republicans invited Netanyahu to address Congress and send a clear message to Obama: hands off Israel. That same week, Obama, not to be out-done, addressed an AIPAC convention and reaffirmed Bush’s promise that Israel will not have to return to the 1967 borders or relinquish its major settlement blocs in East Jerusalem and the West Bank. He also took the occasion to promise an American veto should the Palestinians request membership in the UN – though that would merely amount to an official acceptance of the two-state treaty that the US claims it has been fostering all these years. No, as far as Israel and Israeli Jews are concerned, the conflict and even the need for pretense is over. The only thing remaining is to divert attention to more “urgent” global matters so that the Palestinian issue completely disappears. Voila Iran. Indeed, by clinging to the two-state solution and continuing to participate in “negotiations” years after they have proven themselves a trap, the Palestinian leadership plays a central role in its own people’s warehousing. The reality – even the fact – of occupation gets buried under the diversions set up by the fraudulent yet unending “peace process.” This only enables Israel not only to imprison the Palestinians in tiny cells; witness today’s mini-ethnic cleansing, just one of thousands of micro-events that have the cumulative effect of displacement, expulsion, segregation and incarceration. It also enables Israel to then blame the victims for causing their own oppression! When a Palestinian leadership assumes the prerogative to negotiate a political resolution yet lacks any genuine authority or leverage to do so, and when, in addition, it fails to abandon negotiations even after they have been exposed as a trap, it comes dangerously close to being collaborationist. For its part, Israel is off the hook. Instead of going through the motions of establishing an apartheid regime, it simply exploits the willingness of the Palestinian Authority to perpetuate the illusion of negotiations as a smokescreen covering its virtual imprisonment of the Palestinian “inmates.” Once the current mopping up operations are completed, the process of incarceration will be complete. In my view, while advocacy and grassroots mobilization remain relevant, several tasks stand before us. First, we must endeavor to hasten the collapse of the present situation and subsequently, when new paradigms of genuine justice emerge from the chaos, be primed to push forward an entirely different solution that is currently impossible or inconceivable, be that a single democratic state over the entire country, a bi-national state, a regional confederation or some other alternative yet to be formulated. The Palestinians themselves must create a genuine, inclusive agency of their own that, following the collapse, can effectively seize the moment. Formulating a clear program and strategy, they will then be equipped to lead their people to liberation and a just peace, with the support of activists and others the world over. And here is where Palestinian civil society plays a crucial role, a role that cannot be played by non-Palestinians. If it is agreed that the Palestinian Authority must go if we are to get beyond the two-state trap – indeed, the dismantling of the PA being a major part of the collapse of the present system – then this call must originate from within the Palestinian community. Non-Palestinians must join in, of course, but the issue of who represents the Palestinians is their call exclusively. Non-Palestinians can lso suggest various end-games. I’ve written, for example, about a Middle East economic confederation, believing that a regional approach is necessary to address the core issues. The Palestinian organization PASSIA published a collection of twelve possible outcomes. It is obvious, though, that it is the sole prerogative of the Palestinian people to decide what solution, or range of solutions, is acceptable. For this, and to organize effectively so as to bring about a desired outcome, the Palestinians need a new truly representative agency, one that replaces the PA and gives leadership and direction to broad-based civil society agency, one that has the authority to negotiate a settlement and actually move on to the implementation of a just peace. “Collapse with agency,” I suggest, could be a title of our refocused efforts to weather the limbo in the political process. Until a reinvigorated PNC or other representative agency can be constituted, a daunting but truly urgent task, Palestinian civil society might coalesce enough to create a kind of interim leadership bureau. This itself might be a daunting task. Most Palestinian leaders have either been killed by Israel or are languishing in Israeli prisons, while Palestinian civil society has been shattered into tiny disconnected and often antagonistic pieces. At home major divisions have been sown between “’48” and “’67” Palestinians; Gaza, Jerusalem and the West Bank have been effectively severed; and within the West Bank restrictions on movement among a bewildering array of “areas” – A, B, C, C- Restricted, H-1, H-2, nature reserves, closed military areas – have resulted in virtual, largely disconnected Palestinian mini-societies. Political divisions, especially among secular/traditional and Islamic factions, have been nurtured, not least by Israel. Overall, the Palestinian population, exhausted by years of sacrifice and resistance, impoverished and preoccupied with mere survival, has been left largely rudderless as many of its most educated and skilled potential leaders have left or are forbidden by Israel to return. Ever aware that the struggle for liberation must be led by Palestinians, our collective task at the moment, in my view, is to bring about the collapse of the present situation in Palestine in order to exploit its fundamental unsustainabilty. The elimination of the Palestinian Authority is one way to precipitate that collapse. It would likely require Israel to physically reoccupy the Palestinian cities and probably Gaza as well (as if they have ever been de-occupied), bringing the reality of raw occupation back to the center of attention. Such a development would likely inflame Arab and Muslim public opinion, not to mention that of much of the rest of the world, and would create an untenable situation, forcing the hand of the international community. Israel would be put in an indefensible position, thus paving the way for new post- collapse possibilities – this time with an effective and representative Palestinian agency in place and a global movement primed to follow its lead. Jeff Halper is the Director of the Israeli Committee Against House Demolitions (ICAHD). 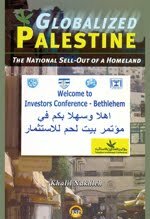 In an important recent piece - Economic Hallucination - Ramallah-based Al-Shabaka policy advisor Sam Bahour exposed the charade played by both Western donors and the Palestinian Authority (PA) to cover up the occupied territory’s inexorable economic meltdown after decades of Israeli military occupation. Arguing that the combined donor-PA approach poses major obstacles to freedom and rights, Bahour concluded: “It’s time for a new economic model, one built on economic justice, social welfare, solidarity, and sustainability.” What would such an economic model look like and how can Palestinians living under occupation move from today’s grim reality to an economy that sustains the quest for self- determination? Al-Shabaka policy advisors Alaa Tartir and Samer Abdelnour join Bahour to debate these questions and explore alternatives. [ePalestine] "My dignity is more precious than food"
"My dignity is more precious than food"
[ePalestine] NO PERMISSION FOR THE BLANKET! I must thank all of you who took action based on the news of Walid’s arrest. Some of your letters and efforts have reached high levels in the Israeli executive and legislative bodies, but sadly, none have brought about his release, just yet, that is. Walid is still being held under what Israel calls Administrative Detention, which means he is detained without charge and neither he, his family, nor his attorney are told why. His fear now is the same that it was when he went through this nightmare of Administrative Detention before, that the six month sentence will be extended for another six months. As Walid’s wife recently noted, “Administrative detention has a beginning but doesn’t have an end.” This is the routine Palestinians have become accustomed to. I refuse to accept all of this, his arrest and his possible sentence extension. Last week, I met with Walid’s attorney and the prisoner’s support organization following up his case, Addameer ( http://www.addameer.org/ ). Walid appealed his six month sentence and lost, as most Palestinian prisoners do, given the military court system is part and parcel of the military occupation. He is being held in the Ofer Detention Center on the outskirts of Ramallah. This detention center is ill-equipped and overcrowded. Prisoners are complaining of many human rights abuses, but most critical right now is the lack of heat and blankets. Ramallah is facing one of its coldest winters in recent memory. Yesterday, I visited Walid’s wife, Bayan, and two beautiful daughters, Mays, 13 years old, and Malak, 4 years old. His daughters are only slightly younger than my own. The burden that befalls mother in such situations is worthy of acknowledgement. Palestinian women remain the backbone of this society, albeit many times as silent heroes. Mays explained to me how her last visit to the prison to visit her father went. She spoke in great detail. I asked if she could write it so I may distribute it for others to see how families are treated. She did. Below is Mays recollection of her last visit to see her dad. The are allowed a visit behind a glass wall every other Sunday. I urge each and every one of you to continue demanding Walid’s release. There is no reason, whatsoever, for him to be detained. If Israel thinks otherwise, they should charge him. If they can’t, then let the man return to his wife and daughters now! And in the meantime, Israel must let the Red Cross deliver ample blankets to the thousands of Palestinian prisoners who they are detaining! NO PERMISSION FOR THE BLANKET! “No permission for the blanket!” This sentence is the only sentence I heard from them. Sunday is my day. My mom told us that we had permission to visit my dad. That night I did not sleep at all from my excitement. It has been one and a half months without seeing my dad. He was taken by the Israeli occupation with no reason! My dream is to know why he was taken. I wake up really early that day and wear my best clothes. My sister was really exited and kept asking me how we are going to visit our dad. I was debating my answer because explaining the way is too complicated to tell such a young girl. We took some clothes and a blanket for my dad because it’s so cold over there. We also took some sandwiches for us in order to eat them while we wait. We are now standing in front of the big door of the prison. We are WAITING, WAITING and WAITING. Nothing new is happening; every time we saw a couple of soldiers coming we jump up like crazy people thinking they are coming to open the door. Then we go back to the same position, WAITING, WAITING and WAITING. My sister is asking me “do we need more time? I am really bored.” I don’t have any answer for her. Two hours pass, finally the huge door opens; at that moment, I thought all the hard part is gone and now the easy thing is coming: joy for just seeing my dad. We hold all the clothes and the blanket that we brought to give to my dad. But it is not the end yet; we got to the window where we can give the soldiers what we brought for the prisoners. I hold the clothes and stand in the row for hours. When the solider called me I ran to the window and put every single thing I have including the blanket. He told me, “NO PERMISSION FOR THE BLANKET.” I was shocked. I started asking WHY? He told me with anger, “NO PERMISSION FOR THE BLANKET!” I told him please, just this blanket. It’s cold inside. He said with blunt words: “NO PERMISSION FOR THE BLANKET!” I took everything and put them back inside my bag with a sad face. There is only one thing turning in my mind, I think how really precious this blanket is right now. It is the most precious thing for my dad. Another huge door is opened and we enter to be checked now. They took our phones, wristwatches, and keys—everything that is related to the free life outside. It is not the end yet. We go trough another small door in order to take off our shoes and jackets. Now we are told to pass through some big machine. My mom tries to tell the solider that children are not supposed to be exposed to this radiation machine. He says enter or leave. So we enter, all of us, including my baby sister. After getting checked, they put us in a small room. We are around 50 people, children, women, and men. They closed the door and we are left together with just one small disgusting bathroom. Time is not moving. We are waiting in a room without a clock, no talking is allowed. A group of silent faces are just waiting and any sound of keys make us all stand up, thinking that it is the end of our wait. Hours are gone and we do not know the exact time. Finally, a solider came, but it was another one of their games to let us jump up again to think that it is time to enter. After few minutes, he went away. And here we are still WAITING, WAITING, WAITING. I still keep thinking about the blanket that I couldn’t give to my dad. I left, holding the blanket and looking back at the door of the prison. I was crying. My dad is going to sleep in the winter cold forever. All of you are sitting in your warm houses and my dad is locked up without a blanket. Order via www.africaworldpressbooks.com or www.amazon.com . I started working full time on the initial draft of this book, in English, about three years ago. While I was seeking a publisher for the English edition, I was determined to have it appear in Arabic first, and in Palestine, because I sought for it to generate national public discourse on our transformation and future, as a people struggling for freedom and emancipation. Indeed, the Arabic edition was published in Ramallah in May 2011. It must be mentioned with appreciation that the translation into Arabic, the publication, and the distribution to public libraries in historical Palestine were possible because of the support of the Rosa Luxemburg Foundation, and the total commitment and determination of its Ramallah staff. Over a span of twenty-five years, or since I stopped being engaged in teaching and research as an academic anthropologist, and shifted to becoming an “applied” anthropologist, or working in the field of so-called “development,” I became preoccupied with how to transform Palestinian society and people - my society and people - from an occupied, colonised, and fragmented society towards a liberated, productive, free, and self-generating society, not dependent on external financial aid. It was, and continues to be, a deeply reflective, agonising, and personal process of thought, analysis, and action, in which I was engaged as a genuine “participant observer,” through which I was aspiring to see at the end of the tunnel a society with a tightly knit social fabric empowered by coherent political, economic, and liberating human values that would rise against colonialism, oppression, and despotism. This book is, in a certain sense, a partial end result of this reflective and analytic process. Through an introduction and four chapters, and by relying on a micro-analytic approach, benefiting from my personal experience as an engaged participant- observer, the book challenges and criticises the various fragmented, non-cumulative, deceptive, and mythological attempts to “develop” Palestinian society over the span of the last thirty years. It is a study of Palestinian “development”: the development of the people, the society, and the political-economic system. It is about how truncated, distorted, and mythological the official claim of Palestinian “development” is and has become. Basically, it is about the role of an informal tri-partite coalition of Palestinian capitalists-political elite, Palestinian “developmental” NGOs, and transnational “aid” agencies in impeding, obstructing, and negating what I call, “People-Centered Liberationist Development” (PCLD). As argued throughout this work, PCLD is inherently a process of social and political self-determination and liberation; and, as such, it aims primarily at resisting and ending foreign occupation, colonialism, and hegemony, as well as internally perpetuated apartheid, be it political, economic, or social. I claim throughout this book that there is an inherent incongruence between Palestinian absolute dependence on Western transnational aid and the Palestinian official expectation that financial aid, whose primary source emanates from Western governments and/or agencies, is the avenue to developing and emancipating Palestinian people and society from the poverty and pauperisation created by the colonial system of occupation, and is supported and sustained by these same sources. I assert that aid advanced to Palestine under prolonged occupation and colonialism is political aid par excellence, advanced to my people, specifically to acquiesce and submit to an imposed political agenda and programme. Such aid shackles, mortgages, and holds hostage the entire current society and future generations in political and economic debt. It is aid that focuses on consumption and mortgaging people. It is aid that is anti-production and anti-liberation. Although this book is about Palestine, it is not exclusively so. It is also about the important lessons that we can learn from South Africa since 1994, when apartheid was transformed into a social category of control, oppression, and a system of exploitation by the people’s own indigenous self-proclaimed leadership. It is also about Latin America and about many other struggling peoples, in whom the current Palestinian struggle is embedded, and cannot be but embedded, thanks to the global process of colonisation and emerging re-colonisation. Since Palestine is still effectively under the hold of Zionist settler colonialism, I benefitted from carefully re-reading and reviewing the work of Frantz Fanon about colonised countries in Africa, and countries where colonisation was formally terminated, but where developments strike an eerie resemblance to twenty-first- century Palestine. From this vantage point, the current analysis cannot be only an analysis of Palestine today; it is an analysis of a wider scope: how the “political economy of the oppressed,” or the “political economy of the occupied,” may look in the globalised twenty-first century. I am sounding serious “alarm bells” for what may happen to us - the Palestinian people and society - if we persist on this path of zealous acquiescence to neoliberal agendas imposed on us by the United State, Israel, Western transnational aid agencies, and corporate finance. In this book, I call clearly and openly for strategic counter “re-engineering” measures that span our perceived collective national consciousness, our prevalent political environment since Oslo, our prevalent economic investment environment, and the abusive role of Palestinian capitalists to maximise their profits. I advocate a need for a determined and purposeful “re- engineering” of the prevalent environment of the tyranny of transnational aid agencies, and the function of such aid, as well as a conscious effort at “re- engineering” the prevalent social, cultural, and normative environment. I don’t claim to offer magical recipes for our collective emancipation. I claim that together we can and should be able to harness our collective creative indigenous energies if we’re determined to liberate ourselves. I hope that this book will be helpful towards this end. Khalil Nakhleh is a Palestinian anthropologist from Galilee who has been residing in this part of the homeland for the last 19 years. He may be reached at abusama@palnet.com.